Does anyone know of an alternative to Evernote Sticky Notes? It seems that the app isn't being updated any more and, although there is a workaround for recent issues users have had, I'd like to find an alternative in case issues develop that can't be fixed. No alternatives that I'm aware of - I'll be interested to see if anyone has any pointers. 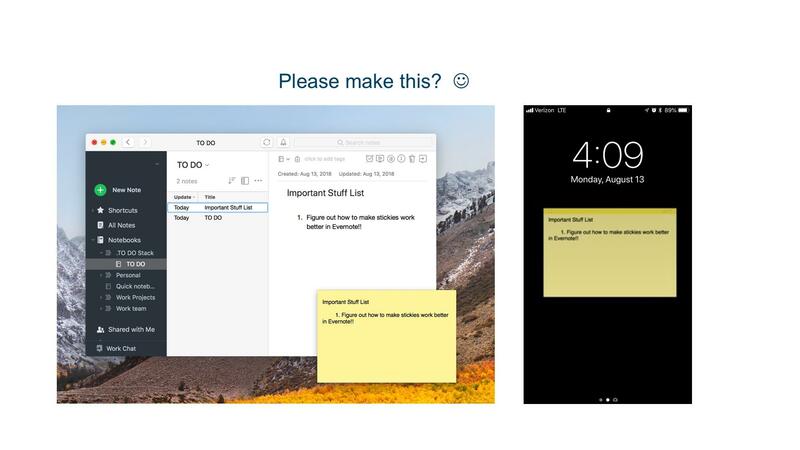 It might be helpful if you can give us some idea of what use you have for sticky notes / what sort of capabilities you'd like to see in a replacement app... is it the ability to connect one or more additional comments to a note on screen? A persistent reminder on your home page / desktop? Darn, I was afraid of that. The main use / advantage of Sticky Notes for me is the fact that they appear my desktop (Windows) all the time. Although I occasionally create more, I primarily have two Sticky Notes that I work with - one is a "scratchpad" that I use it to jot down random stuff, notes when people call, etc and the other is my "to do" list. Having them open on my desktop all the time saves me from having to open Evernote whenever I want to work with them. I thought about just using two Evernote notes and keeping them open all the time but I like the fact that the Sticky Notes notes are small and that they load/open with Windows without me needing to do anything. The ability to take any Evernote "Note" and open it in a wildly simplified alternate display window (a "Stickie") that ideally is not browser-based (towards the simplicity theme). This "Stickie" alternative window allows only very basic editing, is NOT cluttered with menu bars, and can be set to always be on top of other applications on your screen if using on a laptop. Like Evernote, this "app" should be available on multiple platforms (Mac/Win, Android/iOS) and constantly be in autosync with the main Evernote implementation. On the Laptop versions, perhaps the "Evernote Stickie display window" launches/is part of the main Evernote SW package, but ideally behaves separately, at least from a display perspective. ie: minimizing Evernote does not minimize the "Evernote Stickies". The mobile versions would ideally have two modes: The first mode is a "Display" mode, which would display ONE read-only Note/Stickie on my lock screen. The second mode is "Light Edit" mode, which is a vastly simplified interface that allows the quick reading/editing of multiple stickie notes. Of course full edit mode is available by simply launching Evernote on Mobile, and perhaps the creation of a net new Stickie (and hence new Evernote Note) must be done in the Evernote app. The function of "Display" is something like put my directions or grocery list on my lock screen and easily view it without any fuss. The function of "Light Edit" is to thumb through a few stickie notes, jot a new idea down quickly, or edit a list, with vastly simplified interface. Perhaps also choose which one to display on the lock screen. Design feature of "Light Edit" would be quick, simple, uncomplicated access to a small subset of the master Evernote database (only those designated as "stickies"), and be specifically designed for a mobile experience - any "stickie note" should be accessible in 2 touches or less. Full editing and/or Evernotes which are not enabled as "Stickies" would require the heavyweight Evernote app to launch. The design point for both (mobile and desktop) is SIMPLICITY and RAPID EASE OF ACCESS for a small subset of a user's (sometimes voluminous) Evernote content. Think "Clear", "Remember-the-Milk", Wunderlist (now shifting to "Microsoft-To-Do"). As Evernote has ratcheted back it's free implementations (fine with me as a paid user), perhaps a 'lite' mobile version would act as a feeder for the main license (ie: what Microsoft seems to be doing with Wunderlist becoming "Microsoft-To-Do").